The Correct image is a great tool to test how well your learners are retaining the information in your Lesson. 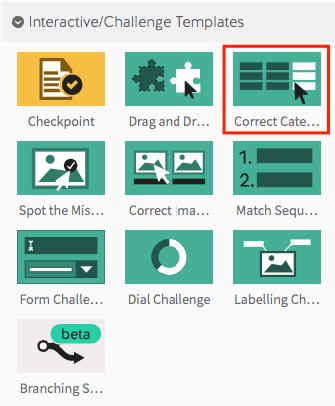 Step 1: Select the Correct Category Template from the ‘Interactive/Challenge Templates’ panel. Step 2: Drag your Correct Category Template into the Lesson Pathway. 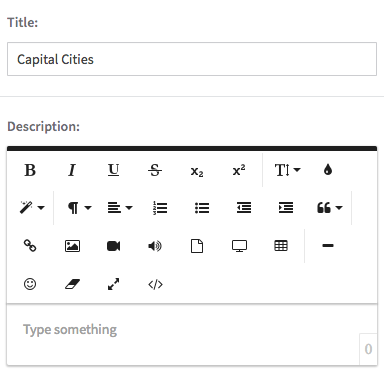 Step 6: To begin adding questions to your template, click the ‘Add New Category’ button. Step 7: Give your first category a title then select the green checkmark. Step 8: To begin adding options for your new category, select the green plus sign. Step 9: Add the text for your new option in the space provided, then select the green checkmark. Step 10: Keep adding categories and options by repeating the process from Step 6. Step 11: To preview your challenge template, click on the ‘preview’ icon.